It is often said that a company’s greatest resource is its people. To continue getting maximum productivity from your staff, it is necessary to develop their individual skill sets and talents. By helping them to thrive, they will have more to offer in terms of capabilities, ideas and enthusiasm. Managing a business effectively also means managing the personal growth of employees. Without appropriate training, an organisation runs the risk of being an outfit with low morale, employees who resent their leaders, decreasing sales, poor public perception, dwindling interest in the product and eventually poor turnover. Training your workers in the latest technology and developments will ensure they have the knowledge to maintain the company’s relevance. Sometimes staff desperately want to do a good job but lack the techniques that could make them really effective. Employees require skills that are hands-on and that can be applied to situations they encounter in the workplace. Choose trainers that excel in what they do and offer training that is professional, perhaps in combination with a mentoring programme that will encourage staff to keep practicing what they have learnt. 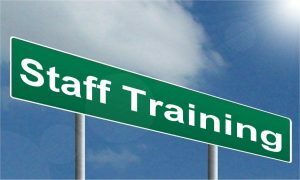 Training seminars can provide skills development that will be relaxed and allow staff to acquire knowledge at their own pace. If you can spare them, there is a range of residential training courses where students are immersed in learning new skills and then using them for dealing with business challenges. Team-building exercises can give staff insights on how to relate more effectively to each other and make the most of each other’s skills. In combination with training staff and giving them vital skills, setting achievable goals where they can use their new skills without too much pressure will give them confidence and should reap rewards for the company as well. Provide clear guidelines with constructive feedback that lets employees know when they are on track and that their efforts are appreciated. This can also let them know – calmly – when they have misunderstood the desired outcomes and give them suggestions on ways to improve their performance. Lead from the front by sharing your own experiences as a manager or business owner and how you developed your skills. If you are approachable, employees will be more likely to come to you for advice or report obstacles rather than struggling on in silence and wasting time. Recognise the importance of what are known as “soft skills” too. These include attributes such as manners, critical thinking, social awareness and cultural sensitivity. These skills are not generally taught in a class room, but all contribute to a harmonious working environment and dealing with customers effectively. The right training and constructive feedback can be a potent mix that should have a galvanising effect on your staff. Deploy these tools, and you should see positive results in the business very rapidly. Eager staff prepared to solve problems and get results are a significant asset for any business. Allsquare are professional accountants in Edinburgh offering financial and business services to help small to medium companies with business growth strategies. For more information, call Allsquare today on 0131 343 1510.